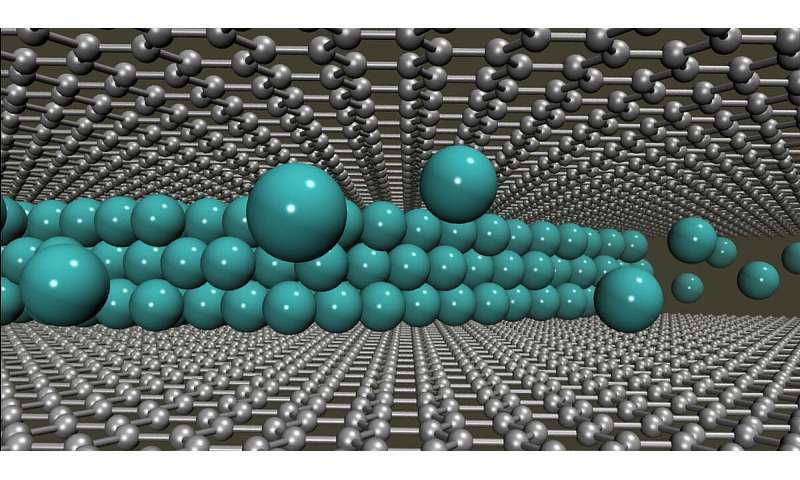 Atomistic model illustrating a multilayer of lithium atoms between two graphene sheets. Credit: Dr. Mahdi Ghorbani-Asl, HZDR. See M. Kühne, et al., Nature 564 (2018). To better understand 2-D materials experimentally, researchers routinely use TEM. The method allows them to suspend small, thin pieces of a material and run a high-energy electron beam over it, ultimately creating a magnified image of the material that researchers can study, much like a movie projector takes images from a reel and projects them onto a larger screen. With this view into a material, experimentalists can better chart and estimate atoms' positions and arrangements. The high-energy beam can do more than just help researchers observe materials, though—it is also a tool to study the electronic properties of 2-D materials. Moreover, researchers can use the high-energy electrons from TEM to knock out individual atoms from a material with high precision to see how the material's behavior changes based on the structural change. Simulations allow researchers to see a material's atomic structure from a variety of different angles, and they can also speed up the trial-and-error approach to designing new materials purely through experiments. "Simulations cannot do the full job, but they can really limit the number of possible variants, and show the direction which way to go," Krasheninnikov says. "Simulations save money for people working in fundamental research and industry, and as a result, computer modelling is getting more and more popular." Breaking this logjam will require researchers to rework algorithms to calculate more efficiently each time step across a large number of cores. Krasheninnikov also indicated that designing codes based on quantum computing could enable simulations capable of observing material phenomena happening over longer periods of time—quantum computers may be perfect for simulating quantum phenomena. Regardless of what direction researchers take, Krasheninnikov noted that access to supercomputing resources through GCS and PRACE enables him and his team to make continual progress. "Our team cannot do good research without good computing resources," he said.